Black and white studio portrait of the Mascioli family. Antonio (Tony) Mascioli is standing at the left wearing a black hat and pinstripe suit. His older brother Leopoldo (Leo) Mascioli is seated in the chair on the right. He wears a white hat and a suit. 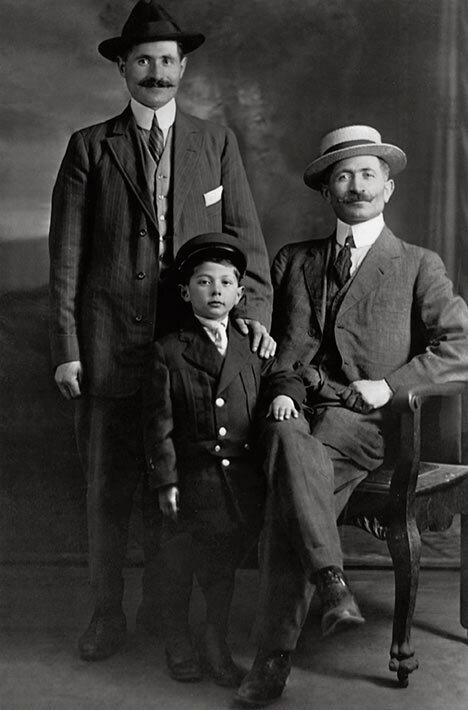 Leo's young son Daniel stands between the two men. Leo Mascioli traveled to the United States at the age of 10. He was accompanied by a distant relative and landed in Boston where he worked as a shoeshine and a newsboy before finding employment in local restaurants. At the age of 19, Mascioli overheard an employment agent extolling the opportunities and adventures one could have in Canada. He traveled to Canada where he took a six-month contract working for a steel company in Sydney, NS. Leo soon took to working at various mines and slowly making his way to Timmins, ON. In 1911, he opened a general store in that town. A few years later Leo began building hotels and movie theatres in various towns in northern Ontario. Some of his business endeavors were shared with his younger brother, Tony, who had arrived to Canada at the age of 17. Both brothers were arrested and interned on June 10, 1940. Leo's son Daniel was 27 years old when both men were arrested and interned. In addition to taking over the everyday operations of the family business, Mascioli Construction, Daniel also took it upon himself to seek out legal counsel and build a case for the release of his father and uncle.